as a little girl i was very compliant. you can ask my mom some day... she will tell you i was the perfect child, that i raised myself. its true. i do not like to disappoint. if you ask me something, i will probably comply. this was even more true of me when i was little. if my mom asked me to do something "to help her out" i would do it. i learned to play very well by myself. if my mom really wanted to take a nap she would put me down for a nap, knowing i would wake up shortly. "if you wake up before mommy, you can come color or play quiet games in my room." and certainly, i would wake up before her, and stumble into her room and onto the floor at the foot of the bed. there i would color, or look at books, or quietly turn on sesame street. but mostly i would grab a huge stack of puzzles from my room and sit quietly on the floor and do puzzle after puzzle after puzzle. when the stack was complete and i had done all of my puzzles, i would start the stack over again. i don't know what it was about puzzles. even at 2 and 3 years old i loved puzzles. i don't know what it is i loved about them the most. the challenge, the accomplishment, maybe i just liked the pretty pictures and shapes. maybe i liked that it was something i could do all by myself; i didn't need no help, zip, zero, zilch. i could entertain myself for hours... with puzzles. i remember my first 24 piece puzzle. i was four, and it was a picture of a kitty with a milk bottle and a little milk dish. it was yellow and pink and blue and pink, with a little grey kitty. i felt very grown up, with my 24 piece puzzle. i didn't want to let anyone help me, i wanted to do it all by myself. and i did. and i couldn't have been prouder. i was on cloud nine. i was really a big girl now. and i loved puzzles even more. as i grew older, i continued to do puzzles. i watched other people do puzzles. i stared in awe at my grandmas 1000 piece puzzles. she would do them on a card table set up by the big window in the living room. she was always busy, they would sometimes take her weeks, but she was always doing them. one day, my life got busy. i didn't have time for puzzles anymore. i was preoccupied with boys in sweaty hats, and shopping, and gossip, and celebrities. i forgot my love for puzzles. but last summer holly entered my life. holly is the puzzle queen. she times herself, and does puzzles i wouldn't touch because they are too hard. but she re-lit my fire. i bought a puzzle, and it is almost done (thanks to holly... she did most of it when she was here this weekend... and i have hardly touched it since then) i have the hardest part left. all the purple sky. but i am remembering how much i love puzzles, the accomplishment, the challenge. i am finding little pieces of myself i've lost everyday. one piece at a time, one day at a time. 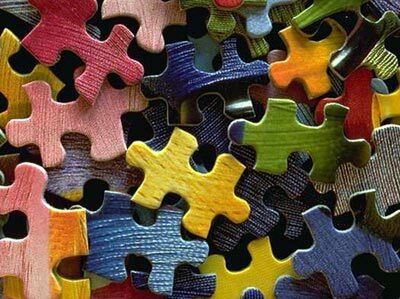 i am a puzzle myself. i am finding the joy in putting pieces together on my coffee table, and i am finding peace in putting the pieces of me back together again. maybe that is why i like puzzles so much. things come together, one piece at a time. when you dump the pieces out onto the table in one crazy colorful heap, it looks like nothing. like a mess, a disaster of national proportions. as you start to separate colors and pieces into neat and organized piles, it starts to feel a little bit more put together. and then you get the outer edge together, and it has some boundaries, some shape. and piece by piece, it starts to come together. until you have just a few pieces left, just a small section left to pull together. and as you fit the pieces into their place you can see the big picture, you can feel the completion arriving, the accomplishment, and all the work starts to make sense. it is finished. it is complete. and you brought it to completion. piece by piece, day by day. You are so good at capturing a picture with your words. It is a God given gift. Thank you for using your gift. i'm very impressed that you haven't given up on that purple sky. i'll lend you some of my easy 1000 piece puzzles, and that will really get you in the puzzle mood. now i'm in the puzzle mood. i agree with A. up there. You're really, really good at this, MS. So interesting your take on puzzles and doing them, I always hated puzzles, never had the patience to sit and finish them. I think it's interesting that you think you are such a quitter, but if you have the patience to sit and do puzzles, you obviously can see things through until the end. Again, your writing is wonderful, the words come to life, love to read your blog Melinda.